You have a wonderful room decorated with old furniture with a private bath. Before that is our large, light-flooded living room with furnace and integrated kitchen. In the double bedroom you will find a small table with chairs, so that you can relax here. The living room also has a winter garden with comfortable set of seats and television. You can sit on the patio or in the garden and also use our sauna. You will find our house located in the middle of Saxon Switzerland. You can stay overnight in our house for € 13.50 onwards. Here you will find peace and relaxation, and also the opportunity to engage yourself in sport activities. There are 2 sophisticated double bedrooms furnished with wonderful antique furniture with bathroom. Our spacious lounge is tiled with wonderful Italian stones, kitchen is integrated. You can spend romantic evenings at the fireplace. There are several seating arrangements. You can cater for your self, and while eating breakfast you will have a splendid view of the mountains. Downstairs there are 2 large rooms for 6 and 8 persons, 3 showers, 2 toilets and a sauna. You can go on various trips, with bicycle, steam boat or by walk. In just 15 minutes' walk you will be in Rathen with its world famous rock theatre. Recreational activities/ Culture: Trips to the nearby state capital Dresden with its varied culture (baroque old town; Museums, Pillnitz water castle, Moritzburg, Frauenkirche, Semperoper, Zwinger etc.). Various medieval age castles and fortresses in the surrounding area (e.g. Koenigstein Fortress, Stolpen Castle), spa and relaxation in Tuscany thermal spa in Bad Schandau, daily pass for bus in the golden city of Prague, 'Elbe Freizeitland' is offered for rock climbing garden and adventure park, a labyrinth and an overhead railway, steam boat rides to Meissen and Dresden and in to Bohemian Swistzerland, Sebnitz with its Caucasian office, Africa house and high rope climbing garden and artificial flower workshop, extensive network of hiking trails through the Saxon Swiss National Park with its impressive mesas, e.g. Gamrig mountain, Lilienstein, Grosssedlitz baroque garden, miniature park 'Kleine Saechsische Schweiz' in Wehlen. Sports: Rock climbing and climbing courses for all skill levels in the unique sandstone landscape, canoeing, mountain biking. Open-air swimming pool in Rathewalde, Elbe bicycle trail. Visit the ski resorts in Rugiswalde in winter, fun pool in Neustadt. You can rent the entire house or even a single room. Waltersdorf is located centrally in Saxon Switzerland, approx. 40 km away from Dresden. The Elbe Sandstone Mountains with its rugged, bizarre rock formations and mesas is one of the interesting low mountain ranges in Europe. You will be enthralled by the flora and fauna, the narrow flight of steps and wonderful view points. There are hiking trails for you that are over 1000 km long. Rewarding destinations are Lilienstein, Prebisch Gate, Fortress and health resort of Koenigstein, as well as the small town Rathen with its rock theatre and bastion, just to mention a few. But you can also drive in to the baroque city Dresden with paddle steam boats or with the historical Kirnitzsch valley tramway up to Lichtenhain waterfall. It is the only tram that runs through a National Park. A trip to Bohemia nearby is possible as it is very close to the border. Richard Wagner museum is located in Graupa near Dresden. 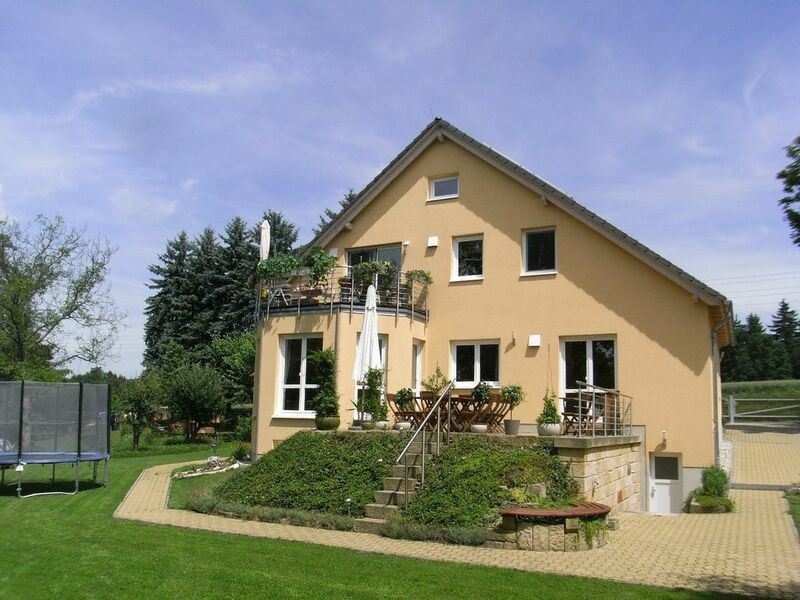 Other activities: Open-air pool in the nearby area of Rathewalde; Tuscan spa in Bad Schandau. DZ 40,- € pro Nacht . Unter 3 Übernachtungen 44,- € pro Nacht. Sie können auch die komlette Unterkunft mieten. 10% Aufschlag über Ostern: Do. - Mo. Himmelfahrt: Mi. -So. Pfingsten: Fr. -Mo. 10% Aufschlag Jahreswechsel: 24.12. -02.01.